This textbook is absolutely tremendous, telling the story of North America, covering the Indian nations, European colonization, and history of the United States up to the 20th century. Told as a series of stories with thumbnail biographies, lives of the saints, maps, and other supplemental material. Engagingly written, with age-appropriate vocabulary and style, and generous explanations of new terms. Stupendous! Students will find the lavish use of color photos and drawings very attractive. 5th grade on up. 466 pgs. Hardcover. Full color. 8"x9½"
The Teacher's Manual is as well done as the textbook and offers goals, activities, quizzes, tests, and an answer key for the questions in the textbook. 178 pgs. The Printed Workbook (Expanded and Revised 2018 Edition) includes varied styles of exercises corresponding to each section in the textbook to provide interesting alternatives to the question-and-answer format provided in the text. Answer key available separately. 118 pgs. CHC’s hardcopy Answer Key to the Printed Workbook is formatted for maximum ease of use. For answers to the questions in the text, please purchase the Teacher’s Manual. For answers to the printed workbook, please purchase the hardcopy answer key. 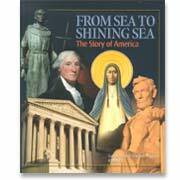 A Hands-On Study Guide to this text is included in CHC Lesson Plans for Fifth Grade. A single-subject lesson plan that includes the Hands-On Study Guide is available here.